You can travel to Thailand during the rainy season and chances are you’ll have a great vacation, but be prepared for clouds, downpours and, worst case scenario, possible serious disruptions in your travel plans. Most of Thailand and Southeast Asia is wet for nearly half the year between June and October. How Often Does It Rain and What’s the Rain Like? In Bangkok, Phuket and Chiang Mai, it rains very frequently (almost every day) during the rainy season, though it rarely rains all day. Storms in this part of the world can be intense, with very heavy downpours, loud thunder and lots of lightning. Downpours typically occur in the late afternoon or early evening, though it does sometimes rain in the morning, too. Even when it isn’t raining, skies are often overcast and the air can be very humid. Yes. Flooding happens in Thailand every year, though not always in areas that are popular with tourists. Parts of Bangkok always suffer at least minor flooding during rainy season. Southern Thailand experiences severe enough flooding that residents are often displaced from their homes. 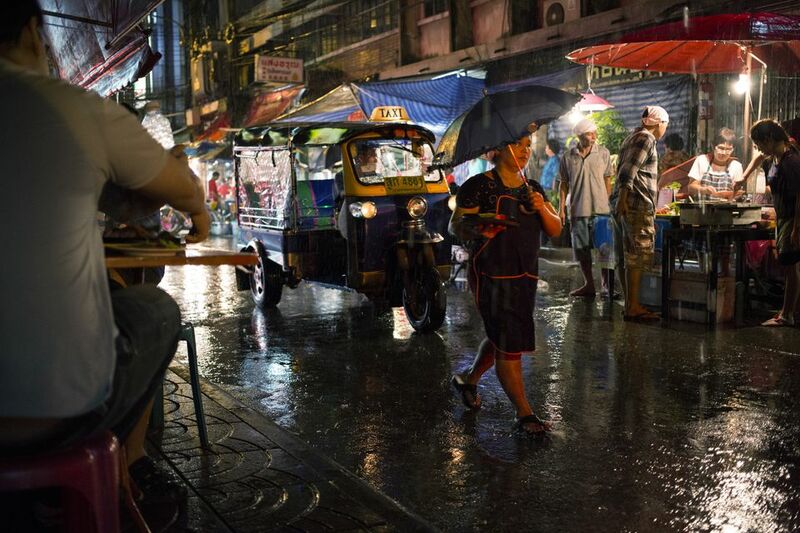 Thailand’s rainy season coincides with the region’s wet monsoon season and often you’ll hear people refer to the rainy season and monsoon season interchangeably. Though the word monsoon conjures up images of intense downpours, the term actually refers to a seasonal wind pattern that pulls moisture from the Indian Ocean to the Asian continent, not the wet weather that often accompanies it. Is Traveling During Rainy Season Cheaper? Yes. It’s definitely cheaper than traveling during high season, and depending on your itinerary, you could save as much as 50% off of cool-season hotel prices. You’ll also see fewer other travelers. Will the Rainy Season Affect My Travel Plans? It could. Depending on where you are visiting, the rainy season could have no impact on your travel plans at all. But it could also totally ruin your vacation. Seasonal flooding and some particularly intense storms in recent years have caused major problems not only for tourists but for those living in the country as well. In March of 2011, Koh Tao and Koh Pha Ngan were evacuated because of intense rains (and this wasn’t even during rainy season). Residents and tourists were transported via aircraft carrier to the mainland and, while that could be a fun adventure in and of itself, there’s nothing fun about being trapped on an island while waiting for someone to come rescue you. In October of 2011, parts of Thailand experienced some of the worst flooding in decades. Much of the province of Ayutthaya was under water and although the main tourist attraction in the province, ruins of the former capital, were mostly unaffected, much of the surrounding area was flooded and transportation routes were also closed for days. Even some stretches of main highways north of Bangkok were closed. Despite these events, thousands of tourists travel to Thailand during rainy season every year, and the vast majority won’t find themselves rescued at sea or wading through knee-deep water while viewing artifacts. If you can be flexible and want to take advantage of cheaper prices and smaller crowds, it could be worth the risk. If you’re planning a once in a lifetime vacation, or you’re traveling to Thailand to spend most of your time on the beach, you will probably be happier coming either during the hot season or during the cool season. The cool season isn’t “cool” so much as just not oppressively hot and in terms of weather, it’s the absolute best time to visit Thailand. While most of the year the whole country feels sticky and hot, during the cool season it’s just pleasant and comfortable but still warm enough to enjoy the beaches and islands. If that’s important to you, plan a vacation in Thailand between late November and early February. Is There Anywhere I Can Visit During Rainy Season? Yes. Head for Samui, Koh Pha Ngan or Koh Tao. It won’t be totally dry but it gets significantly less rain during the rainy season than the rest of the country. Although Thailand’s seasons tend to be consistent across the country, the Samui Archipelago, in the western part of the Gulf of Thailand, has a slightly different rainy season and most precipitation occurs between October and January. So, if you want to travel to Thailand between June and October, the region’s islands are a good alternative. Samui isn’t totally dry during the rest of the country’s rainy season, though, so you may encounter overcast skies, rainfall and a fair bit of humidity. Of course, the islands adjacent to Samui were the scene of some of the worst off-season rains and flooding the country had seen in a while in 2011, so there are no guarantees when it comes to the weather!